We’d love your help. Let us know what’s wrong with this preview of Ashoka in Ancient India by Nayanjot Lahiri. In the third century BCE Ashoka ruled in South Asia and Afghanistan, and came to be seen as the ideal Buddhist king. Disentangling the threads of Ashoka’s life from the knot of legend that surrounds it, Nayanjot Lahiri presents a vivid biography of an emperor whose legacy extends far beyond the bounds of his lifetime and dominion. To ask other readers questions about Ashoka in Ancient India, please sign up. is it too technical or a biography collated from historical literature ? If we are asked to name three great Indian emperors of all time, few people would settle at any other combination than Ashoka, Chandragupta II and Akbar. Ashoka is chronologically the first among them. Indian rulers of all times aspired to reflect some aspect of his legacy in their own reign, as he was the founder of a ‘unique political model of humane governance’. Ashoka made discourses with his people in the form of rock edicts scattered all over the country, like some kind of early ‘mann ki b If we are asked to name three great Indian emperors of all time, few people would settle at any other combination than Ashoka, Chandragupta II and Akbar. Ashoka is chronologically the first among them. Indian rulers of all times aspired to reflect some aspect of his legacy in their own reign, as he was the founder of a ‘unique political model of humane governance’. Ashoka made discourses with his people in the form of rock edicts scattered all over the country, like some kind of early ‘mann ki bath’. ‘The afterlife of Ashoka, like his real life, is poised between legend and truth’. Nayanjot Lahiri is an eminent historian who has many excellent books to her credit. Lahiri has made a commendable survey of Ashoka as the emperor of India in this book. Devoid of any agenda or political leaning, Lahiri’s works are honest tributes to historical scholarship, as compared to the political manifestos churned out by other reputed authors like Romila Thapar or Irfan Habib. Lahiri begins with the rationale for yet another book on Ashoka. He had fascinated generations of writers and scholars. The emperor talks to the people through the many rock and pillar edicts distributed across the length and breadth of the land. ‘He did not want to appear to posterity as either recondite or imperious, but instead as a flesh-and-blood ruler guided less by power than compassion’. His renunciation of war at the height of military glory sets him apart from other monarchs. Perhaps this air of edified spirituality endeared him to the later rulers of India. Nehru is said to have identified himself with Ashoka. The national emblem adopted by the newly independent India was the famous Ashokan lion capital at Sarnath. India also adopted the Ashoka Chakra in its flag. The most astonishing fact is that the name of Ashoka had slipped out of the public mind in the subcontinent, as all memory of Ashoka and his edicts was lost in India for some twelve centuries after the visit of Xiunsang, the Chinese pilgrim in the seventh century. People saw these curious inscriptions on rocks in a strange tongue, but remained clueless as to its author. It was the painstaking work of British orientalists in deciphering the stone inscriptions that brought to light the saga of the ancient monarch. This story is told in detail in Charles Allen’s Ashoka – The Search for India’s Lost Emperor. The first modern biography of Ashoka was Vincent Smith’s ‘Asoka – the Buddhist Emperor of India’. The author narrates the life and times of Ashoka from religious texts like the Ashokavadana, Dipavamsa and Mahavamsa and also from Megasthenes’ Indica, written by a Greek ambassador to Chandragupta’s court (Ashoka’s grandfather). The evidence is patchy and the author has liberally employed her rich imagination to fill up the blanks. The result is a work very much heartening to read. Ashoka’s tenure at Taxila in quelling an insurrection and his stay at Ujjain as the governor of the province are described. Ashoka met a merchant leader’s daughter at Vidisha and two children were born of that dalliance. Even though we would like to think that Ashoka’s polity didn’t discriminate between people of the four varnas, both Mahinda and Sanghamitra didn’t inherit the throne. They were the spiritual heirs of their father and were dispatched to Sri Lanka for missionary work. Ashoka assumed the reins of power after killing his numerous half-brothers. Lahiri wryly remarks that he did much to gain power for which a life of contrition and reflection was necessitated later. He was a Buddhist right from inception on the throne, but his fervor rose as time went on. The battle of Kalinga brought about a transition experience. It was at this time that he employed rocks and pillars to record his proclamations to the people. Ashoka becomes historical and real with these conquests of the mind. Lahiri somewhat justifies the emperor’s military adventures by describing similar expeditions of other world rulers. This is very interesting and informative, but redundant. Kings’ lust for power and aggrandizement can be taken for granted without going to the bother of comparing with others. The author’s greatest achievement in this text is the illuminating analysis of Ashoka’s edicts that lie scattered over the subcontinent, from Dhauli in Odisha to as far west as Kandahar in Afghanistan. She has travelled to most of the places where the edicts are located and has accorded a vivid description of the lay of the land, the interesting features of the rock and pillars and the meaning of the inscriptions. The narrative assumes the charm of a neatly penned travelogue to those ancient relics. Ashoka had been mindful to inscribe his message to people in hard stone. The maturing of royal philosophy of life is visible from the steady progression of ideas on vegetarianism to morality and support to the Buddhist faith. The first edicts ran from six to twenty-two lines. Later edicts became larger, and a series of messages containing more than a hundred lines are seen. The elaborate carvings extended to multiple rock surfaces as well. The growing confidence of the emperor can be discerned from the standardization of content. One point is to be noted here. The terms ‘major’ and ‘minor’ used to denote the edicts do not imply the size of the rock on which they are inscribed. ‘Major’ denotes the length and content of the message, of which, there are fourteen in number. Meticulous care has been gone into the selection of language and script so as to be intelligible to the people inhabiting the surrounding areas. The language used is Prakrit and script Brahmi for all edicts in the heartland of the empire in present-day India. At the same time, Ashoka was mindful of the influence of foreign languages in his border provinces. This concern is given material form as a bilingual edict near Kandahar. The languages used are Greek and Aramaic and the script Kharoshti. Lahiri notes with approval that the translation was done by capable hands. The interpreter has done a free translation of the message, and the word eusebia is used in place of dharma, which is a tricky word even for modern translators. Ashoka conceptualizes a rudimentary welfare state, with benevolent concerns for the wellbeing of men as well as animals. This change in administrative policy is suggested to have links with the precepts of Arthashastra, whose composer was a contemporary of Chandragupta Maurya, Ashoka’s grandfather. His rock edicts range from the ninth regnal year. The first edict was discovered in 1822 at Girnar, followed by a string of new finds. As of now, 50 such edicts have been catalogued, the latest being at Ratanpurwa, Bihar found in 2009. We agree with the author that Ashoka was ahead of his times, but assigning environmental concerns ascribed to the prohibition of killing fish in the period of chaturmasya (July to September) as a kind of wise effort to protect them during their breeding season is a little farfetched. 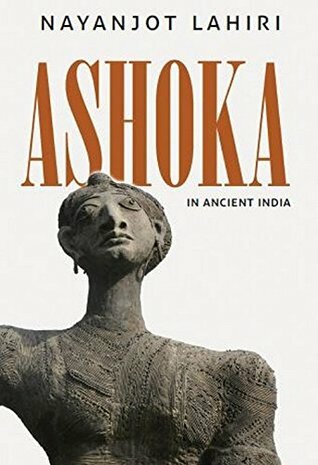 This book is a fascinating attempt to recreate the life and times of Ashoka, through his epigraphs, archeology and the traditions in and around the places where these were put up and through an imaginative construction of how people in ancient India were likely to have understood these messages. Lahiri’s mastery of literature as well as history is evident in the scholarly quotes from reputed books of history as well as from Shakespeare. A good number of photographs of the edicts and places where they are located are also provided. The book is also graced with a nice index, an impressive bibliography and large number of notes for clarifying the finer nuances in the text. We know about the emperor Ashoka only what he wanted us to know through the stone and pillar scribblings that he was so desperate to spread through his kingdom for his people and for people of the future. All these inscriptions on various pieces that have survived the turmoils of time and come down to us, join together and try to weave a story around the valiant emperor, so distinctive of people on his position, that he kept down the sword and picked up peace, trying to transform his people and We know about the emperor Ashoka only what he wanted us to know through the stone and pillar scribblings that he was so desperate to spread through his kingdom for his people and for people of the future. All these inscriptions on various pieces that have survived the turmoils of time and come down to us, join together and try to weave a story around the valiant emperor, so distinctive of people on his position, that he kept down the sword and picked up peace, trying to transform his people and make them walk on the path of 'Dhamma', a path which sought good of others. Centuries after his death, people sat down with all the stories they have heard about this peace-seeking Buddhist emperor and juxtaposed them into texts, all drawing through same threads yet distinctive of each other. These stories still revolve around and can be heard when a historian tries to look into the past and understand who Ashoka was? A question so full of answers yet empty. Lahiri's book is a struggle between the contemporary sources and the one that came into being after the emperor. With all that she can put in her hands, she tries to weave a biography of an emperor, who lived 2000 years before her time. An emperor who wrote everything he wanted his people to do and how he was an example of it all, yet remains dumb on how he came into being and how he dies. Who was the real Ashoka? The truth about history is that you can never know it all. A good insight into the life of Ashoka through his rock and pillar edicts, many of which have survived without much damage over the course of 2200 years. I skimmed parts of the book, as I was not interested in many details, an exciting read nevertheless. Too scholarly for my taste. I made it just over halfway through it in three months. More on archaeology than on Ashoka.